Hope everyone had a great weekend! Mine couldn't have been better - a three-day weekend full of sunshine and beautiful weather, friends, family, and lots of good food! I ended the weekend Sunday night with our Easter dinner and since I enjoyed the meal so much, I thought I would share it with you today! 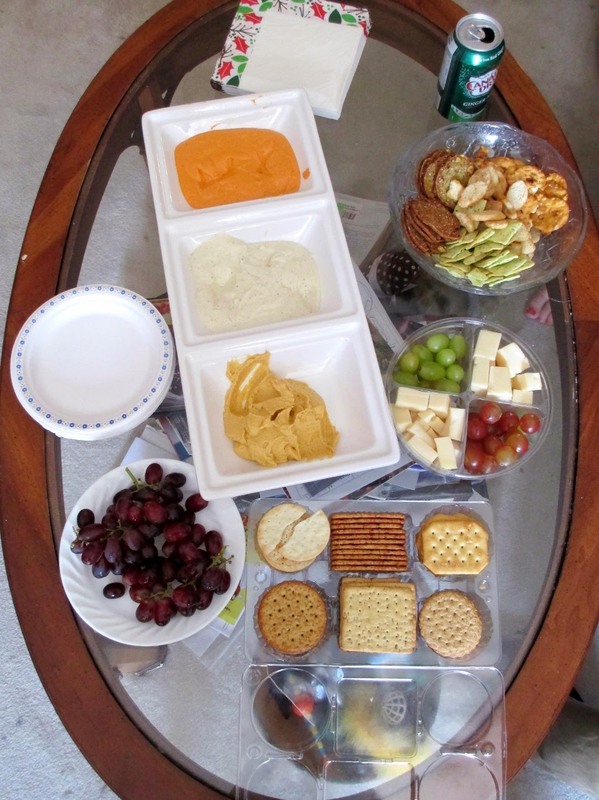 We started off with some appetizers which included three types of dips (red pepper hummus, baba ganoush, and sweet potato hummus) with an assortment of crackers, cheese and grapes. 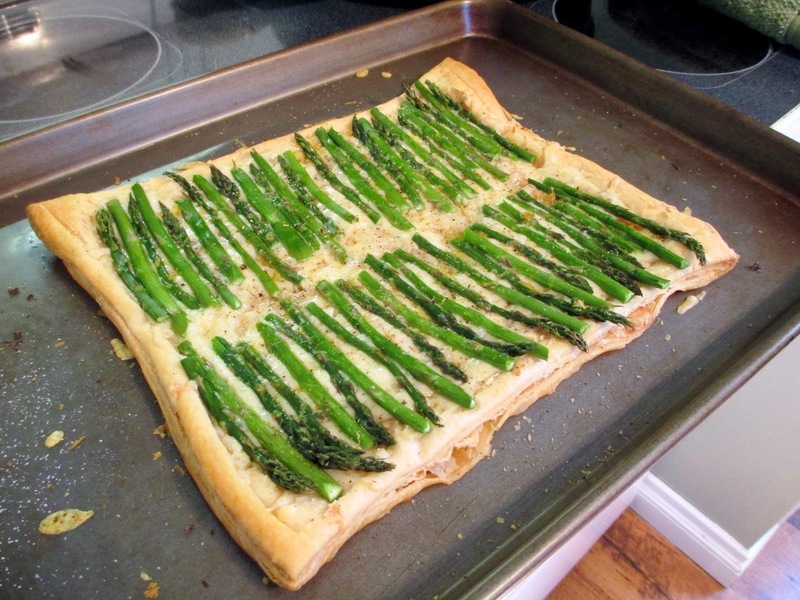 Our main course was ham, and for a vegetarian option I made this asparagus gruyere tart from Martha Stewart. I had made it a few years ago for Easter and liked it, so I tried it again but with a different type of cheese this time (oka and some parmesan). The puff pastry that I used ended up flaking off a lot so it was a bit messy to eat, but it still tasted really good! My other contribution to the meal was a vegetable side dish. I saw these roasted baby carrots with lemony dill pesto on the blog With Food + Love recently and thought it looked so gorgeous that I wanted to make it for our Easter dinner. 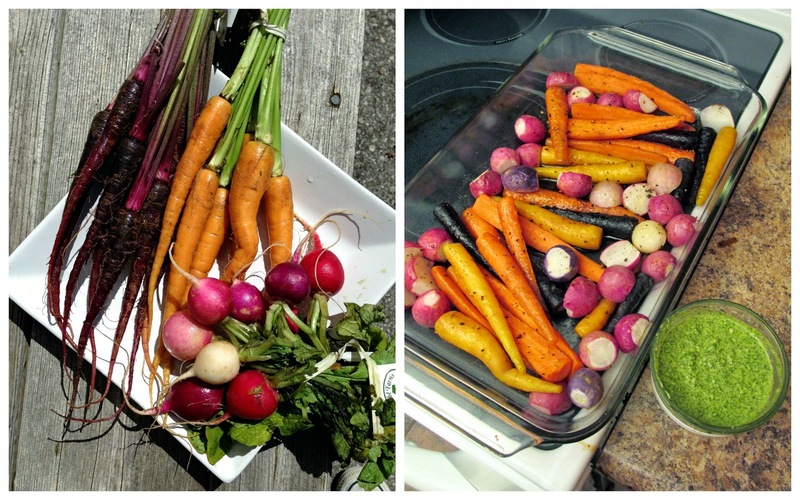 I used a mixture of orange, yellow, and purple baby carrots, along with some purple and pink radishes because I love roasted radishes. The veggies didn't quite get roasted long enough because we were in a bit of a hurry to get dinner on the table, but the pesto turned out really well and was a nice accompaniment! To round out the meal, my aunt made a delicious scalloped potato dish (recipe here) that had both regular potatoes and sweet potatoes, lots of cheese, and fresh thyme. 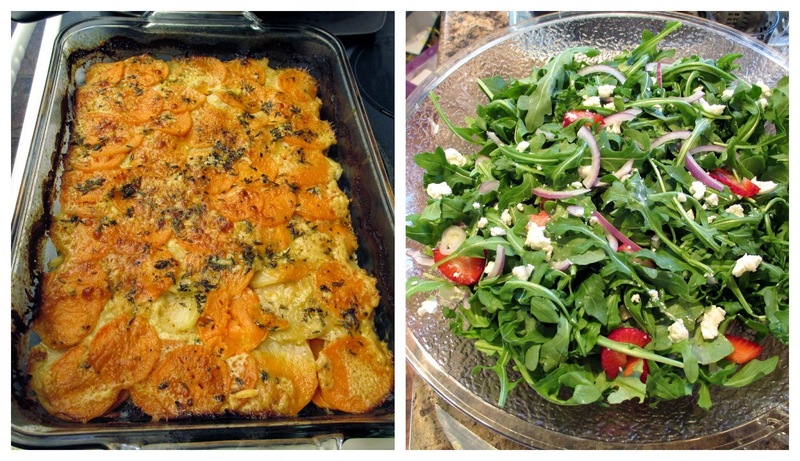 I'm normally not a huge fan of scalloped potatoes, but I loved the addition of the sweet potatoes in this recipe! My mom also made a nice light salad that had arugula, strawberries, red onion, and goat cheese. Here's a pic of my beautiful meal all together before I devoured it! 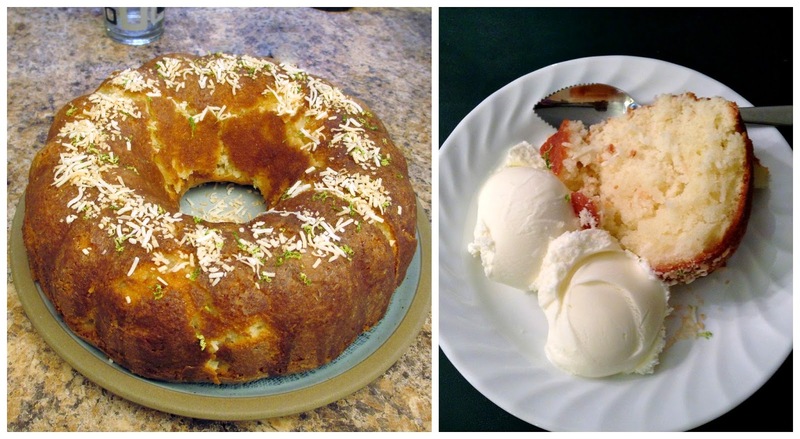 Finally, for dessert my sister made a coconut lime bundt cake from a recipe in Ontario's Food & Drink magazine. It was nice and fluffy with lots of lime flavour, and we served it with lime ice cream from Marble Slab too, which was very refreshing! Not only did I get to enjoy this meal, but I also got some gifts from the Easter bunny to take home with me. I got a tin of strawberry rhubarb loose leaf tea from David's Tea, which I can't wait to try because it smells amazing; a pretty ceramic travel mug, and a plastic wine glass with a lid that I'll use in the summer for sitting outside. Great gifts, great food, and a great time overall! With the Easter holiday coming up this weekend, normally I would be posting an Easter-themed recipe on my blog this week. But for some reason, my Easter inspiration just wasn't there this year - I couldn't come up with anything that hasn't already been done! So if you're looking for a cute Easter idea, check out these peanut butter bunnies and raw cookie chicks that I made last year. 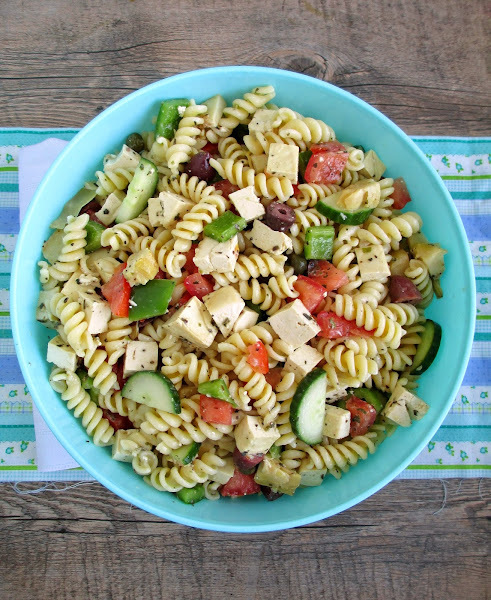 Or if you're just here for the recipes, I've got a great pasta salad to share with you today! 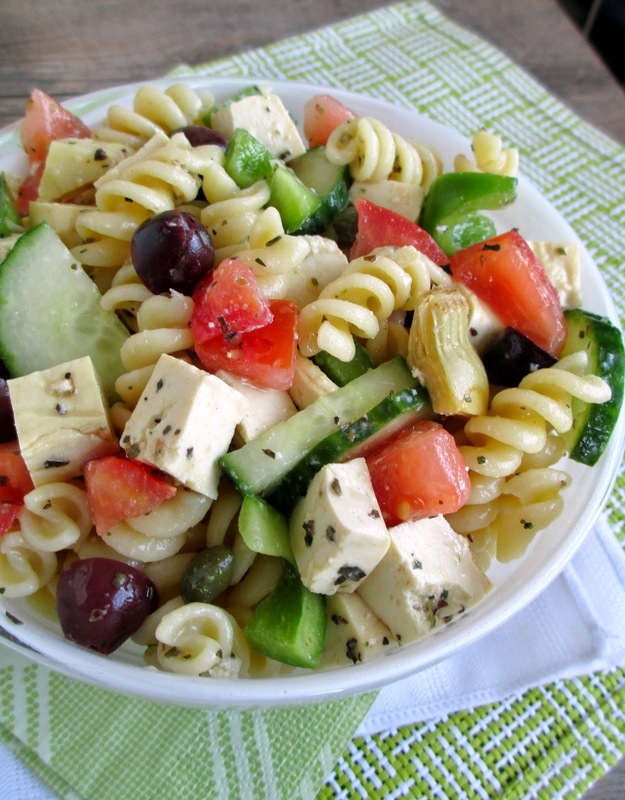 I'm not typically a huge fan of pasta salad, as it can sometimes be a bit boring. For me, the keys to a memorable pasta salad are to add lots of veggies, some kind of protein, and a flavourful dressing - all of which are included in this recipe! 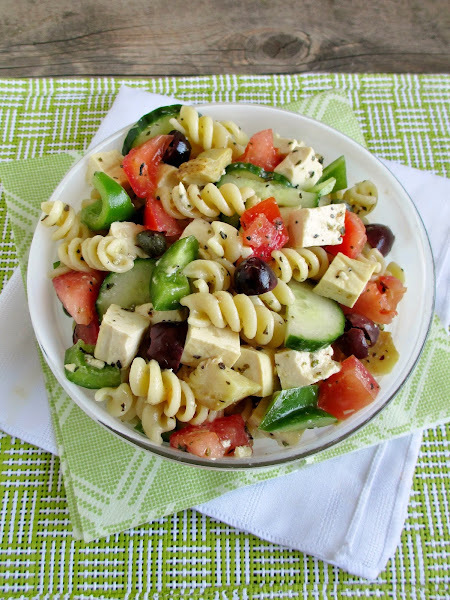 This dish is like a bulked-up Greek salad - besides the usual veggies that you would find in a Greek salad (tomatoes, cucumber, and peppers - I left out red onion based on personal preference), I added olives, artichokes, and capers for lots of salty, briny flavour, and rotini pasta to help soak up the dressing. Instead of using traditional feta cheese, I decided to make "tofu feta". If you've never heard of this idea, you can mimic the flavour and texture of a salty cheese by marinating uncooked firm tofu in a dressing made with lots of lemon juice, miso, a bit of olive oil, and lots of herbs. The tofu was actually my favourite part of this dish - I love the chewy texture and it really soaked up the marinade so it didn't just taste like bland tofu! I also loved how each bite was full of ingredients - the ratio of pasta to veggies was a bit skewed towards the veggie side, which is how I prefer my salads! This makes a lot of pasta - enough to feed yourself for lunches for the week, or it would make a great potluck or BBQ dish to share with a group! First, start marinating the tofu. If you don’t have already pressed tofu, press it between layers of paper towel with a heavy object on top for at least 15 minutes to remove excess water. Slice tofu into small cubes (about ½”). Whisk together the remaining ingredients to make the marinade. Place tofu slices in a shallow container and pour marinade over top. Let sit for at least 30 minutes, tossing occasionally to make sure all the tofu pieces get coated. Bring a large pot of salted water to a boil and add pasta. Cook for length of time specified by package directions, then drain and rinse with cold water. Meanwhile, prepare the veggies (green pepper, tomatoes, and cucumber) and place in a large bowl. Add the olives, artichokes, and capers. When the pasta is done, add it to the bowl as well. Make the dressing by whisking all ingredients together. Add salt and pepper to taste. Pour dressing over pasta salad and toss to mix. Add tofu to the bowl, including any leftover marinade. Add parsley and toss well to mix. Happy Friday! Instead of posting a new recipe this week, I wanted to clear out some of the pictures I've been holding onto and share some of the things I've been eating and enjoying lately with you. Hope you enjoy this little taste of my life and I'll be back next week with a new recipe! 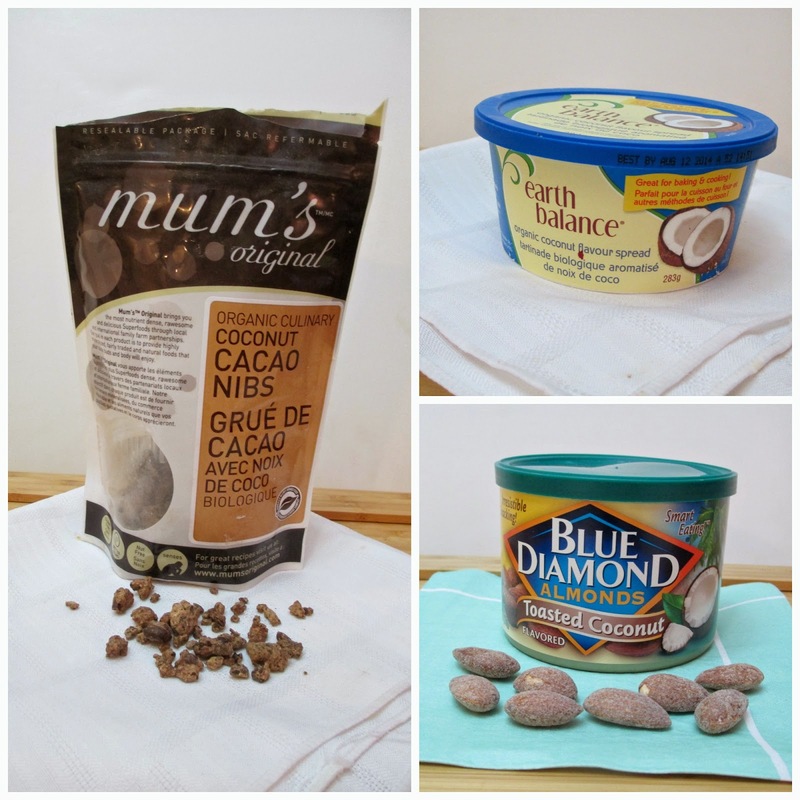 Coconut is one of my favourite flavours, so I tend to try a lot of coconut products! I got a bag of coconut cacao nibs for Christmas and it disappeared pretty quickly - I mostly add them to smoothies, but I've also used them as an oatmeal topping, as an addition to energy balls, and as a chocolate chip replacement in baked goods. I don't actually find that these taste like coconut, as they're just coated in coconut sugar, but they are tasty! I discovered the coconut spread from Earth Balance a while ago, and I love spreading it on toast or even cooking with it. I also found these toasted coconut flavoured almonds on my last visit to the US, and they make a great snack, or chopped and added to salads! I've been hearing about toast being the new fad in the foodie world, but I've been enjoying it as a quick and easy meal for quite a while already! I recently found this hearty grains sliced bread that I think makes the perfect toast because it's still soft and fluffy but sturdy enough to hold lots of toppings. 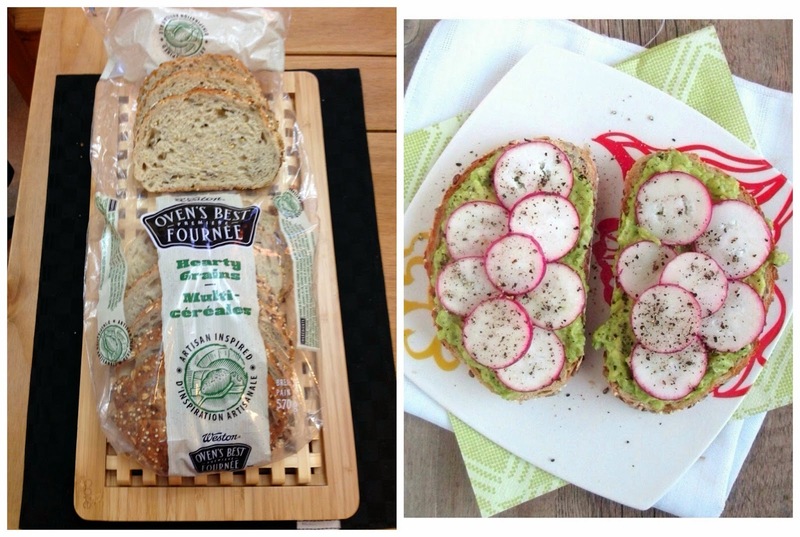 My favourite toast toppings are mashed avocado with lemon juice, or the coconut spread I mentioned above with sliced radishes, salt and pepper - or a combination of both as shown above! Now that the days are longer, the sun has come out, and temperatures are rising, I've already started to get back into my obsession of last summer - self-serve frozen yogurt (pictured above was a mix of caramel latte, white chocolate, and peanut butter flavours - yum!). 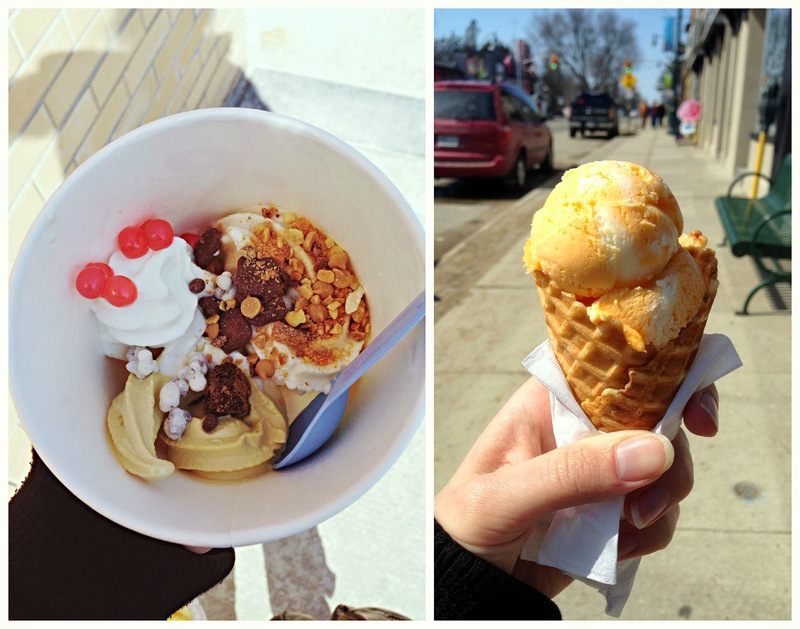 I was also craving ice cream last weekend and the nearest ice cream shop was serving Kawartha Dairy products so I treated myself to this creamy orange and vanilla waffle cone - so good! I got to try a new wood fired pizza place (called Pie) a while ago that I wish would come to my own city because I wanted to try so many things on their menu! After much consideration, I finally decided on the St. Lucia pie, which came with pineapple and shredded coconut (I declined the bacon). The crust was thin and foldable, and I don't know why more pizza places don't offer coconut as a topping - I loved it! I've celebrated a few friends' birthdays recently, and I always like the chance to make birthday treats! 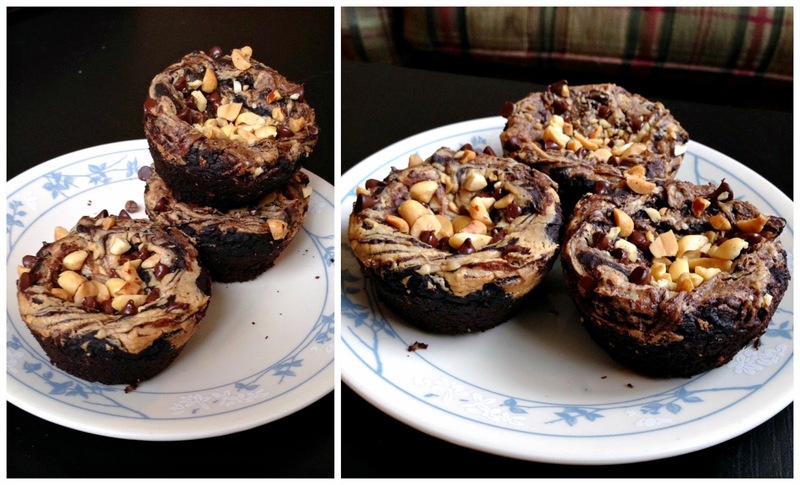 One of the treats I made was these peanut butter swirled black bean brownies from Minimalist Baker. I'm not much of a brownie person, but even I had a hard time staying away from these! I thought they had a nice texture and weren't too "healthy" tasting for a brownie. It's been awhile since I've made a layer cake so I was nervous about this one, but luckily it came out perfectly! 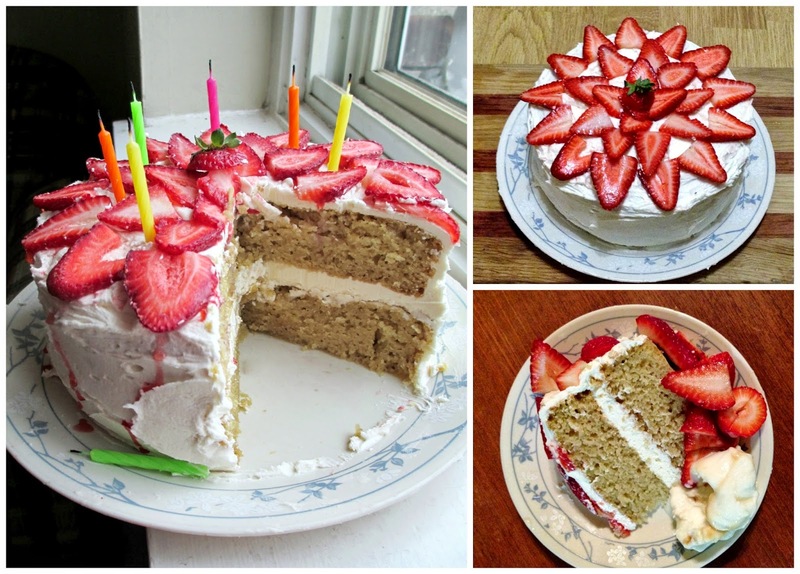 The cake was a simple vegan vanilla cake that I found on All Recipes, and I coated it with a basic buttercream frosting and some sliced strawberries on top. I thought the cake was nice and moist and I liked the dense crumb, and it went well served with extra strawberries and ice cream! I also made these funfetti rice krispie squares for another friend's birthday this past month (there are plenty of recipes online, but I followed one from Sally's Baking Addiction). They have funfetti cake mix in them plus rainbow sprinkles, topped with a layer of chocolate glaze and more sprinkles! 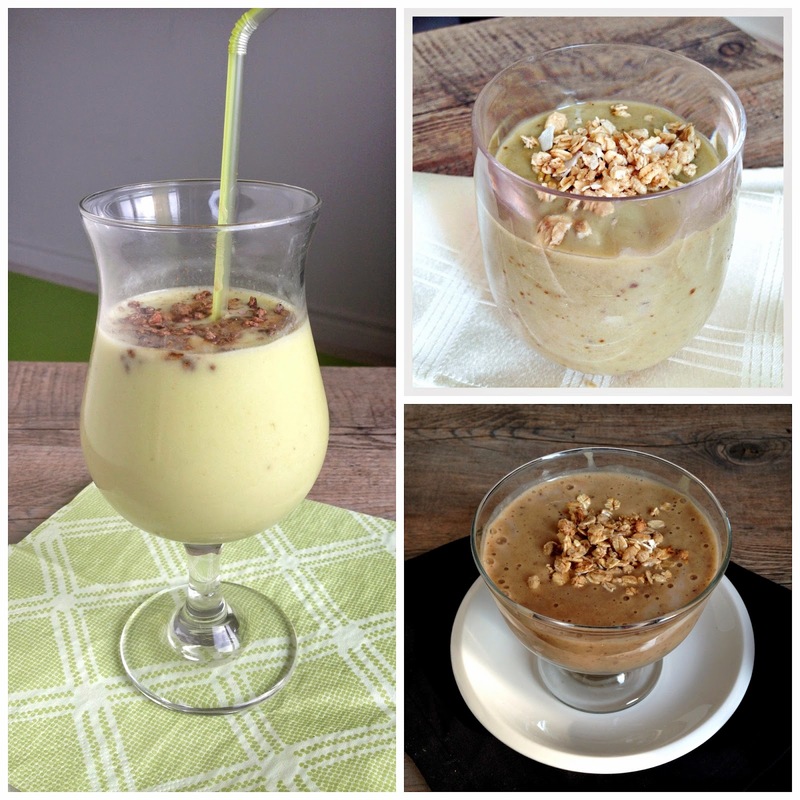 These were fun and easy to make and tasted good too! 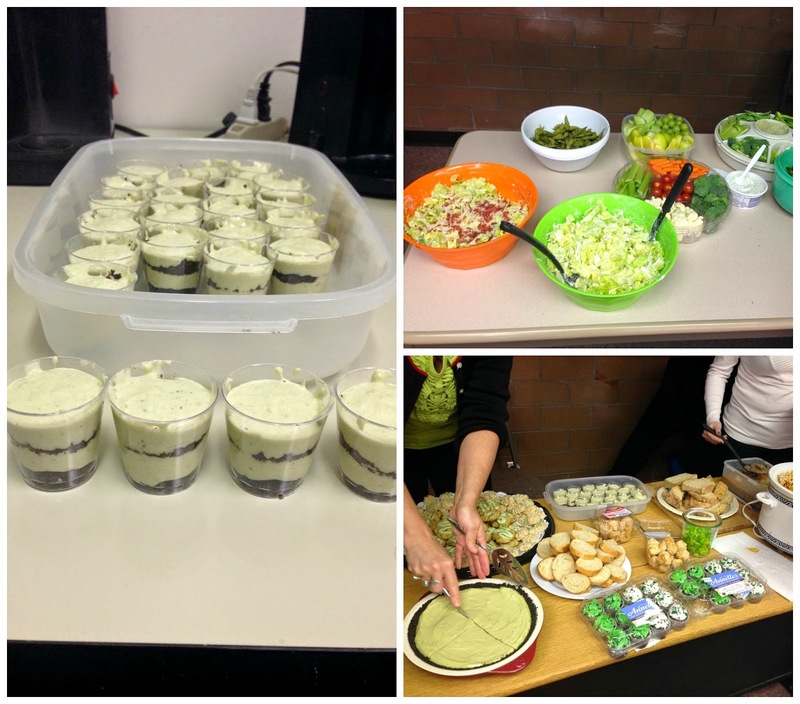 In March, we had a St. Patrick's Day potluck, where we all had to bring in a green food. There were salads, dips, veggies and fruit, and some soda bread and Irish stew to go with the theme as well. My favourite dish was an avocado lime pie with oreo crust - I'll have to get the recipe! For my contribution, I made minty no-bake cheesecake cups layered with oreo crumbs and tinted green with some spinach. They didn't turn out quite how I was hoping so I'm not sharing the recipe, but I still liked them! A couple of weeks ago, my family and I went on a tour of a sugar bush just north of the city. 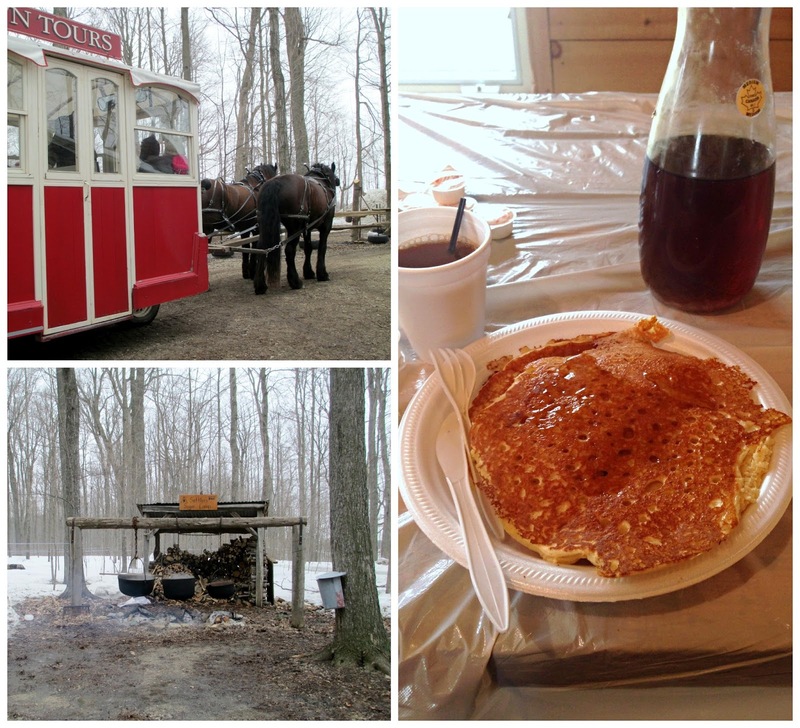 We took a horse drawn carriage ride around the area, learned about the different methods that have been used to make maple syrup in the past, and finished off the tour with a plate of giant pancakes served with three different types of local maple syrup. And of course I bought a bottle to take home too! Thankfully the weather has warmed up since that weekend, and I'm hoping the sunshine and warm afternoons are here to stay! I'm already looking forward to being able to sit outside to read or eat lunch, and of course more frozen yogurt and frappuccinos! A chai latte has always been one of my favourite drinks to order at coffee shops, but most of the time when I go Starbucks or other places, I'm in need of a bit more of a caffeine kick so I end up ordering some kind of latte (for those of you in Canada, I recommend the new maple macchiato!). For those times when you're craving a chai latte but also want a bit more caffeine, a "dirty chai" - chai latte with a shot of espresso - should do the trick! Or if don't feel like going out to a coffee shop, you could make these cookies inspired by that drink (and by these caffeinated cookies from Healthy Food for Living) instead! 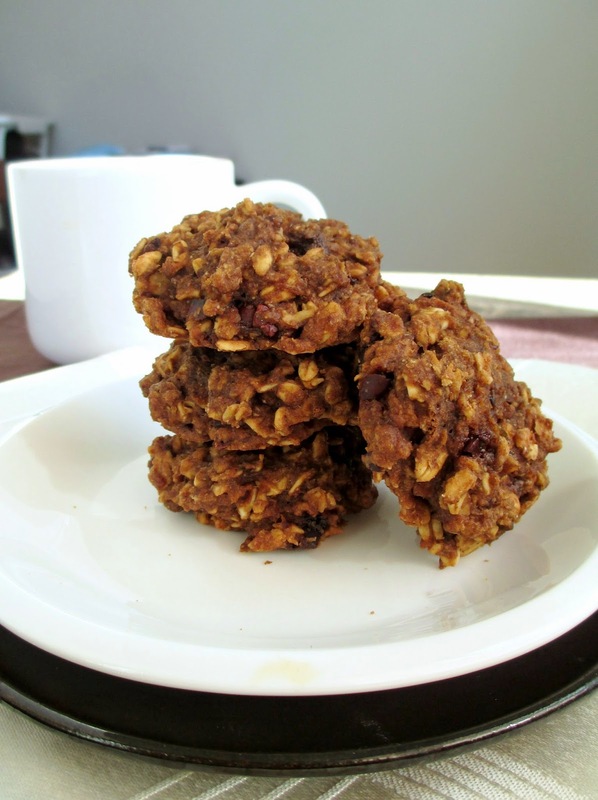 The original recipe was for healthier oat cookies with a dose of both brewed coffee and instant espresso in them. For my version, I used strong brewed chai tea for the liquid, with both instant chai and instant coffee added to the dry ingredients. And for even more chai flavour, I added some spices like cinnamon, ginger, allspice, and cardamom. The first time I made these, I found them a bit too dry and not quite strong enough in the coffee flavour, so I adjusted the recipe a bit by reducing the flour and increasing the amount of coffee, and they came out just how I wanted - a soft and cakey cookie with a mix of both chai and coffee flavours! 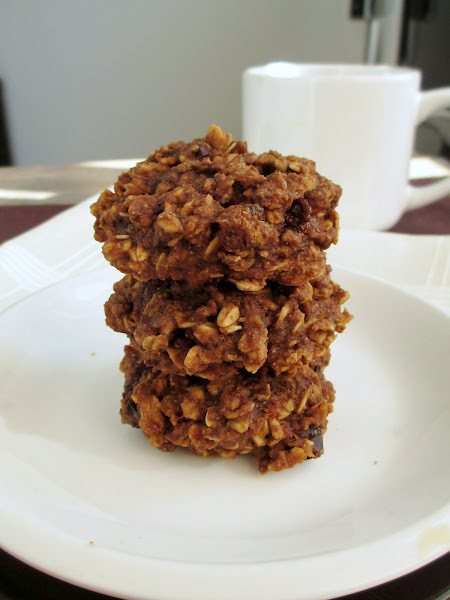 I also replaced the oil with coconut oil and reduced the amount a bit to keep these cookies healthy enough to eat for breakfast, or any time of the day when you need a bit of an energy boost! In a large bowl, whisk together the dry ingredients (flour to cardamom). In a separate bowl, stir together the chai tea, maple syrup, brown sugar, coconut oil, flax, and vanilla. Let cool a bit, then pour this mixture into the dry ingredients and stir until the dry ingredients are incorporated. 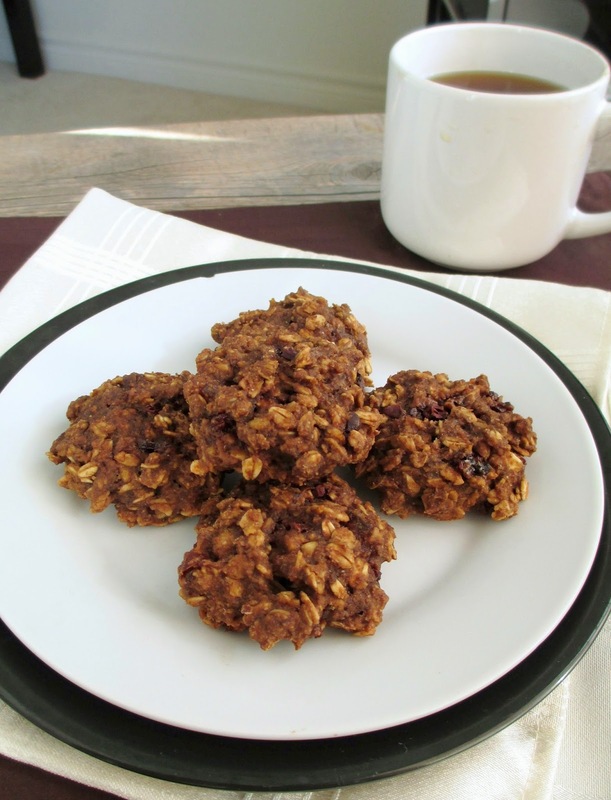 Mix in the dates and cacao nibs. Drop spoonfuls of the cookie mixture onto the prepared baking sheet and press down slightly to form a cookie shape. Since the dough will still be a bit warm (from the tea), place the baking sheet in the freezer for about 5 minutes so the cookies firm up. Bake in the preheated oven for about 12 minutes. Let sit on the pan for a few minutes, then transfer to a wire rack to cool completely.